If you are looking to surrender a rabbit to us, please note that our rescue is currently beyond capacity. At the moment, we have approximately a 6-8 week wait on intake of new bunnies. What we can do is post your bunny(ies) on petfinder and begin screening applicants for their new family immediately. All we need from you are 3 good pictures of the bunny(ies) and all pertinent info (name of bunny, age, breed, temperament, *neutered/spayed*?) We will create a file for your bunny and add you to our waiting list. Once we have a foster spot secured (or a new family, which ever comes first) we will bring your bunny in! In addition, we do ask a donation for private relinquishments. 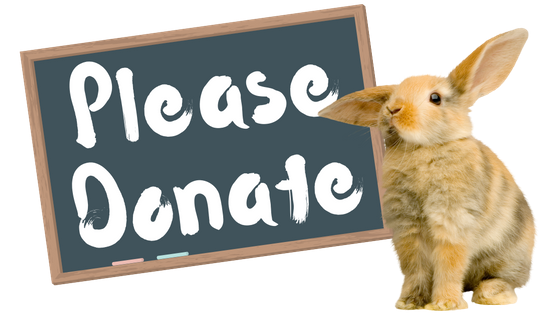 All relinquishments require a $60 donation to cover the veterinary and care costs associated with the intake of a new bunny. Please contact us for more details on intake.